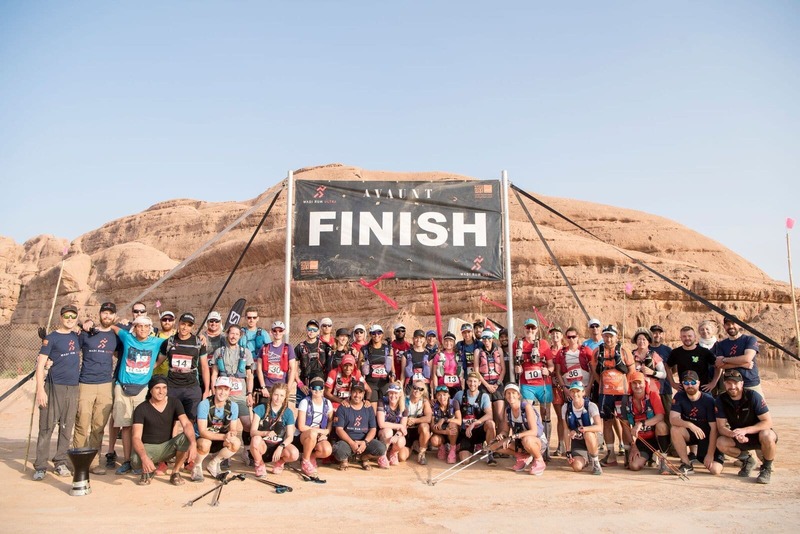 Sit­ting in the depar­tures lounge of Amman Air­port at 2:30am, 2 days after the last of the run­ners crossed the fin­ish line in the 2018 Wadi Rum Ultra and 24 hours after the com­pet­it­ors bid their farewells to their new found fam­ily of crew and com­pet­it­ors alike, it seems sur­real to think that only 7 days ago the 2018 Wadi Rum Ultra had not even star­ted. A part of me feels like no words or pic­tures will ever do justice to the actu­al exper­i­ence had by those who were out in the desert for those few days, and the only way to truly real­ize it is to come out and exper­i­ence it for your­self, but I think it is import­ant to tell the story of the race and the indi­vidu­als who made it. Just get­ting to the start of this event is an adven­ture in itself, both for the run­ners and the crew this marks the cul­min­a­tion of months of hard work, research and pre­par­a­tion. Des­pite an array of late drop outs in the final few weeks, a record num­ber of com­pet­it­ors arrived in Amman for the offi­cial race brief­ing in the Larsa Hotel on Sunday the 7th Octo­ber. This field included a few famil­i­ar faces, loc­al Salameh Al Aqra, the former Mara­thon Des Sables Cham­pi­on and two time win­ner of the race was back to defend his title, and in the ladies field Mar­ina Ranger (3rd over­all and top lady in 2017). Amaz­ingly, 47% of the field were female run­ners. To the best of my know­ledge no oth­er ultra has had a closer ratio in his­tory, and as a dir­ect­or of a com­pany whose aim is to make the sport as access­ible as pos­sible this was a dream come true. This was prin­cip­ally made up of a group of young women named “Team Like a Girl”, an inspir­a­tion­al group chan­ging per­cep­tions of what women are cap­able of. Sunday included a race brief­ing in Amman, fol­lowed by kit checks and med­ic­al assess­ments by in house doc­tors and a team of osteo­paths. Dr. Danny Long­man from Cam­bridge Uni­ver­sity began gath­er­ing data to allow run­ners who were inter­ested to get a full and per­son­al­ized report of how their body changed dur­ing the race. Details included changes to body fat and muscle, core body tem­per­at­ure, testoster­one levels and levels of cog­nit­ive func­tion. Going for­ward Ultra X are delighted to be able to offer this to all their ath­letes to aid their event pre­par­a­tion and sub­sequent eval­u­ation. At mid­day, coaches and a fleet of Land Rovers col­lec­ted the par­ti­cipants and crew and drove in con­voy down the King Hus­sein High­way to Rum vil­lage. 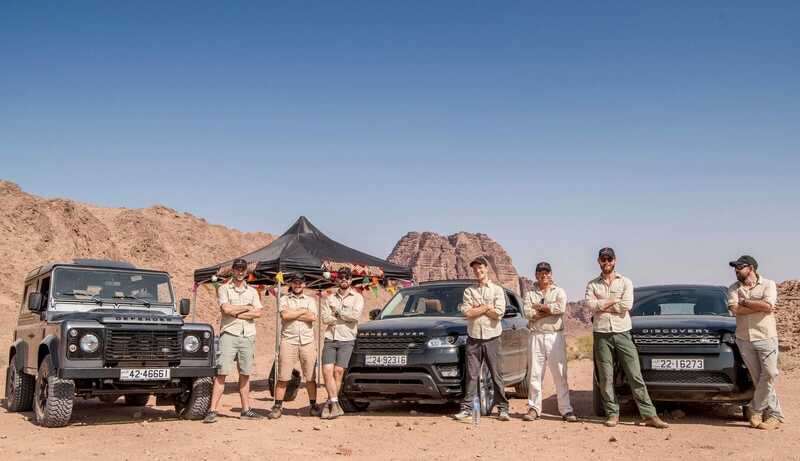 When the coach could go no fur­ther the run­ners dis­em­barked onto a group of pickup trucks to trans­port them to their camp­site for the very first night in the desert. The vehicles pulled into camp just as the sun set over the rocks. After set­tling in run­ners were giv­en a health and safety brief­ing from the Oper­a­tions Dir­ect­or Lee Fudge and camp rules were reit­er­ated. After this, the race dir­ect­ors gave a final wel­come and a quick sum­mary of the week. The race can­not be won on day 1, but it can def­in­itely be lost. Hav­ing seen com­pet­it­ors high on adren­aline and tapered legs fly out in the past, we were hop­ing that this wouldn’t be the case this year. After enjoy­ing the sun­rise and get­ting a first glimpse of the beau­ti­ful val­ley of the moon, it was time for a final mes­sage of good luck. As Cre­dence Clear­wa­ter blas­ted through the air the com­pet­it­ors took their first steps of the race. Loc­al Jord­ani­an Salameh al Aqra set a blis­ter­ing pace from the off and with­in 25 minutes the field was spread. Dave Phil­lips from the UK fol­lowed closely by 3 Brit­ish Army officers from the Roy­al Lan­cers set a fast pace. Charles Hen­son just pip­ping fel­low officer Toby Free at the 40km mark to fin­ish 1 minute ahead in third place with Juli­en Anani-Isaac just behind, with Iron­man triath­lete Jan Pas­cal Schudy and Tom Elli­ott hot on their heels. The battle for first lady was fierce with Josie Adams and Sarah Thompson push­ing hard all day to keep up an incred­ible pace, with Kate West­cott fin­ish­ing just 24 minutes behind them. Team Like A Girl (TLAG) showed great spir­it and team­work through­out the day. They were here in Jordan to show that no mat­ter who you are you can achieve any­thing with the right pre­par­a­tion and determ­in­a­tion and they showed that in full today. Mar­ina Ranger, Lucy Sacarello and Jod­ie Gauld, ran the entire day togeth­er and crossed the fin­ish line arm in arm behind the top 3 women. Jod­ie Gauld amaz­ingly signed up for the race just 4 days before the race start. The day’s course was undu­lat­ing with a dif­fi­cult final 10km stretch made up of heavy sand and a vast open expanse with min­im­al shade. The pace evid­ently slowed as the ath­letes real­ized the immens­ity of the chal­lenge ahead. At the final check­point as bod­ies begun to break­down, osteo­paths Kier­an and Alex were on had to ease any pain or niggles. At the back of the pack Rena Mutagu­chi, Kiko Mat­thews and Ed Par­sons sol­diered through, fin­ish­ing late in the day as the sun star­ted to drop. Loc­al run­ner Youssef Habasa, struggled with an ankle strain, but pushed through the pain to fin­ish the stage. It was great to see 100% of the field make it through the first stage and the atmo­sphere at camp was strong. As the loc­al head of tour­ism came to camp to wel­come us to Jordan, com­pet­it­ors refueled and dir­ect­ors talked through the day’s per­form­ances as well as what was in store for day 2, the sun set and it was evid­ent to see people begin­ning to relax. On day 2 run­ners were split into two groups with the first set­ting off at 6.15am loc­al time, with the second, quick­er, group start­ing 1 hour later to stag­ger the race. The 6.15am start coin­cided with a beau­ti­ful sun­rise and the first group enjoyed 2 hours of cool tem­per­at­ures before the shad­ows were over­come by the blaz­ing sun. Des­pite the cool start though it took just 45 minutes for Salameh to over­take the last com­pet­it­or in group 1. Matt Tomkins was advised against start­ing day 2 due to a stom­ach bug which had hampered him since day 1. It is always a dif­fi­cult decision to make, but the day’s rest allowed him to rehyd­rate, recov­er and have a crack at the long stage which was the fol­low­ing day. Day 2 had a lot of heavy sand which was incred­ibly tough on the com­pet­it­ors, in par­tic­u­lar between the 30–40km mark just as the hot­test part of the day came around. As the crew kept a close eye on all com­pet­it­ors it must have been a tough men­tal battle for the com­pet­it­ors to stick at it and avoid the com­fort of a sup­port vehicle. Hen­son and Free raced hard and man­aged to beat Phil­lips, the stage 1 run­ner up in a battle which was becom­ing more and more excit­ing to fol­low. Sarah Thompson came in 6th over­all, des­pite some ser­i­ous quad pains. It was amaz­ing to see her get faster and faster as the week went on. Kate West­cott also demon­strated great strength with anoth­er steady day, com­ing in 30 mins later in second place. Day 1 ladies win­ner dropped off to 16th over­all after a tough day in the sun. Mar­ina Ranger and Lucy Sacarello crossed the fin­ish line in joint third. They only ever moved up in the rank­ings as the week went on. A few part­ner­ships had already formed by this point, with Faith Cow­ell and Rebecca Bren­nan, Lucy Wheel­er and Emily Ball, pair­ing up to run togeth­er, and amaz­ingly com­plet­ing the remain­ing 4 days side by side. Lauren Mor­ton, founder of Team Like a Girl, after a tough first day got stronger and stronger as her com­pet­it­ive nature became evid­ent. It was good to see her work­ing hard to pick off com­pet­it­ors as the check­points passed. Mara Avhez­ari and Mol­lie Mil­ling­ton showed tre­mend­ous per­sever­ance through what was a ser­i­ously tough day and in doing so per­son­i­fy­ing the spir­it of the Team Like A Girl ath­letes. Ed Par­sons picked up his pace and fin­ished 6 places ahead of his Day 1 rank­ing after com­ing to the con­clu­sion that run­ning and get­ting it over with was less pain­ful than walk­ing. Towards the back of the field was still total new­comer to run­ning, Kiko Mat­thews, (who had attrac­ted com­pan­ion Mark Brockle­hurst — former Atlantic row­er and part of the unof­fi­cial group — Team Like A Dad). Rena Mutagu­chi, hav­ing been strug­gling with blisters picked up on Day 1 amaz­ingly made the decision at check­point 1 to remove her train­ers and do the remain­ing 40km in sliders. An amaz­ing test­a­ment to her char­ac­ter, with the final 15km spent walk­ing along­side the loc­al Bedouin in charge of pick­ing up the last flags. 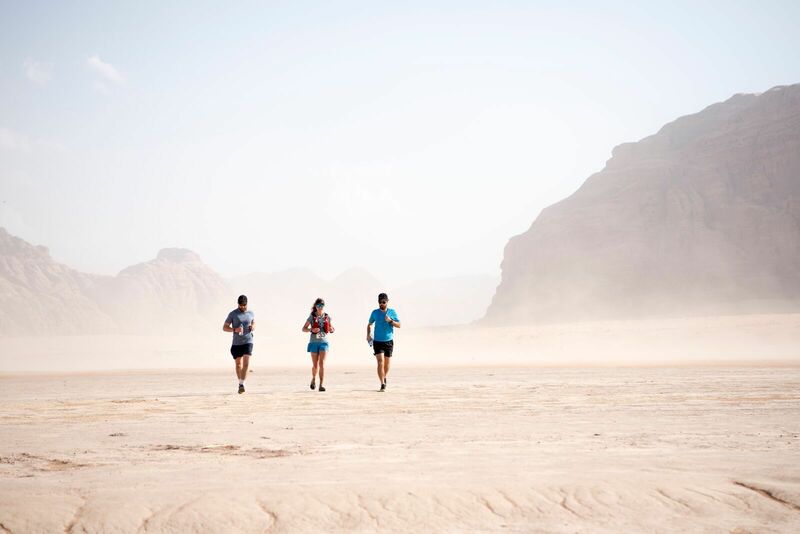 Stage 3 is the ‘Long Day’ of the Wadi Rum Ultra and it cov­ers a dis­tance of 70km and starts in total dark­ness in the early hours of the morn­ing. Only light from the moon and head torches are avail­able to light the way. The stage fin­ishes in the amaz­ing ‘Rock Camp’ — a huge elev­ated cliff ledge sur­roun­ded by tower­ing moun­tain faces. The com­pet­it­ors set off in two waves, the first at 04:00 and the elite wave, includ­ing only the top 10, at 05:00. For a lot of these run­ners this was the fur­thest they had ever covered in one day. When you take into account the sear­ing heat and com­ing off the back of 2 mara­thons this was the ulti­mate test of mind and body. It was evid­ent that for some run­ners the early start was a huge aid. Jack Jer­voise, who was in the first start, came through check­point 2 in first place declar­ing his inten­tion was to hold off Salameh (who had star­ted an hour later) until at least the 30km mark, which he man­aged by just 30 seconds, fin­ish­ing in an impress­ive 8th over­all for the day. In the men’s race it was a famil­i­ar story with Phil­lips and Hen­son bat­tling for 2 and 3, whilst Jan Pas­cal crept up behind them. In the women’s Thompson pulled off a phe­nom­en­al feat fin­ish­ing in 5th over­all des­pite going through some dif­fi­cult stom­ach issues which lim­ited her abil­ity to take on fuel. At check­points it was through grit­ted teeth that she would declare that she needed to get it over with as soon as pos­sible. Kate West­cott fin­ished only 5 minutes behind. Dr Danny was mon­it­or­ing athlete’s core body tem­per­at­ures through­out the day, and it was Dave Philips who topped the charts with 40.5C. Heat exhaus­tion is sup­posed to be evid­ent at 39… so it was fair to say that they were push­ing them­selves! “Rock Camp”, where the stage cul­min­ates, is an enorm­ous ledge over­hanging a vast val­ley which is sur­roun­ded by moun­tains and jebels. Com­pet­it­ors sleep in the open and can enjoy a night with the truly unique vista. It’s the per­fect reward for a massive effort. Unfor­tu­nately, Yousef Habassa and Rena Mutagu­chi were forced to drop out before the 30km mark as they were unable to make the 2 hour per 10km cut-off times. It is a dif­fi­cult decision to have to make as a dir­ect­or, par­tic­u­larly for such strong indi­vidu­als who would have prob­ably just kept going until they made it. How­ever, for the safety of every­one we can­not have com­pet­it­ors spread too widely across the course that it becomes dif­fi­cult to mon­it­or. The rest of the pack plugged away impress­ively, with the final 2 com­pet­it­ors, Kiko Mat­thews and Alan Wilson cross­ing the fin­ish line shortly after sun­set to a huge crowd of com­pet­it­ors and Bedouins blow­ing horns and beat­ing drums across the val­ley. Matt Tomkin also came back from the brink to com­plete the stage in just under 13 hours. Day 4 offered some of the most beau­ti­ful val­leys and canyons of the region, many made fam­ous by Lawrence of Ara­bia. Com­pet­it­ors had to pass through a huge course and clam­ber down a steep rocky pass with huge boulders either side. This was Jan Pas­cal Tschudy’s day, a Swiss triath­lete and abso­lute gen­tle­men, who had hardly looked out of breath all week, and seemed remark­ably com­fort­able in his first multi-day race. Jan came through only 20 minutes behind Salameh, and well ahead of the third place, set­ting up an epic battle for places in the final day, the likes of which had not been seen before. Peter Schleider and Simon Wer­gen who had been extremely strong and steady all week had very fast days, fin­ish­ing in 5th and 9th over­all respect­ively. In the women’s field, Thompson once again pushed her­self to the abso­lute lim­it, com­ing through in 6th place over­all only to col­lapse and be forced onto an IV drip by the med­ic­al team back in camp. Wescott held second, and a good day from Asics fron­trun­ner Han­nah Leith, who was one of the most con­sist­ent per­formers in the week came in just under the 8 hour mark. Unfor­tu­nately, there were two com­pet­it­ors, Lisa Sam­mons and Ed Par­sons who had to drop out at check­point 2. Mat­thi­as Ehrhardt was unfor­tu­nately unable to start due to a pro­hib­it­ive knee issue. Massive cred­it must go to each of them for mak­ing it through the long stage des­pite ser­i­ous injur­ies. It was great to see Rena and Youssef back in action and fin­ish­ing this day, after hav­ing been forced to stop the pre­vi­ous day. Josie Adams, who flew off on the first day, was evid­ently feel­ing the heat after push­ing so hard early on in the race. Thoughts of quit­ting are easy to have, and the crew were con­cerned over her health and mon­it­or­ing her through­out, there were times when it seemed like she was con­sid­er­ing throw­ing in the tow­el. As such, see­ing her cross the line, being jogged in by two of the doc­tors, George and Gareth, was one of the most emo­tion­al moments of the week and reduced sev­er­al of the crew to tears. An amaz­ing demon­stra­tion of guts and determ­in­a­tion. 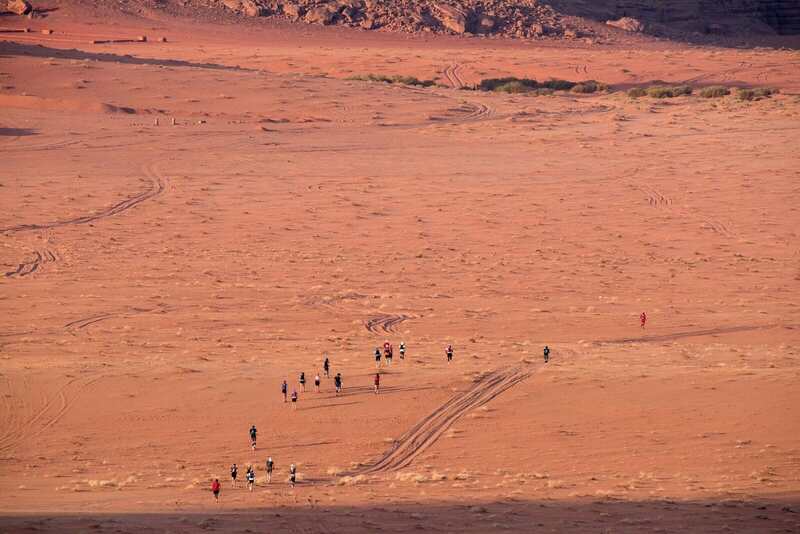 The final day is the shortest of the race and involves a loop from the Oas­is Desert camp. For all, the end is in sight and this day is just a mat­ter of get­ting home and cel­eb­rat­ing the end of a huge week of effort. How­ever, giv­en the race for 2nd, 3rd and 4th pos­i­tion had just 14 minutes in it, Dave Philips, Jan Tschudy and Charles Hen­son were nev­er going to be tak­ing it easy. The cir­cuit entailed a 10km dune sec­tion before cross­ing a long val­ley in heavy sand where com­pet­it­ors can see the field for miles ahead, there is then a final energy sap­ping climb to the final check­point of the week before the final stretch, an oppor­tun­ity to see what is left in the legs where flat salt plains allow the oppor­tun­ity for a little speed. A last minute change to the route, due to the pro­duc­tion of a Hol­ly­wood movie, (also sup­posedly hav­ing been gran­ted a per­mit in the area), added a little curve ball to the day, as organ­isers were only able to com­mu­nic­ate this to run­ners mid stage. The news was taken well by every­one. At check­point 2 there was noth­ing between the lead­ers, Charles and Jan, with Dave push­ing hard from behind. All three were evid­ently in pain in what was the hot­test day of the week (reach­ing 37C for the first time). It was only in the final 5km of the race where the gap star­ted to open, with Charles Hen­son find­ing some­thing in the tank and blitz­ing the last sec­tion to fin­ish an amaz­ing 2 minutes behind Salameh and clinch­ing the much coveted second place over­all and win­ning a free place to an Ultra X race of his choice in 2019. Jan Tschudy was unable to keep up the pace and dropped off to fin­ish five minutes behind, with Dave Philips right on his tail. Out­side of the mens, there were a few who were obvi­ously not going to leave any­thing on the field, with Toby Free, Peter Schlieder and Simon Wer­gan all hav­ing good days. Steven Platts, who as many had, seemed to get stronger each day of the race, fin­ished with a sprint across the line fin­ish­ing 7th for the day. Kiko Mat­thews, who her­self con­fessed to only doing a max­im­um run of 9 miles in train­ing for the event led the last day with a highly amus­ing 100m sprint. Sadly she was unable to keep up this blis­ter­ing pace for much longer but still did incred­ibly well to fin­ish the event when not even she thought she would. An unbe­liev­able achieve­ment and test­a­ment to her will­power, hav­ing spent a ridicu­lous 52 hours on her feet. Beers and soft drinks were provided at the fin­ish line to all com­pet­it­ors — the first chilled drinks avail­able all week. Each per­son home was wel­comed with open arms to the extent that dir­ect­ors and staff were often amongst the last to be able to con­grat­u­late those cross­ing the line. 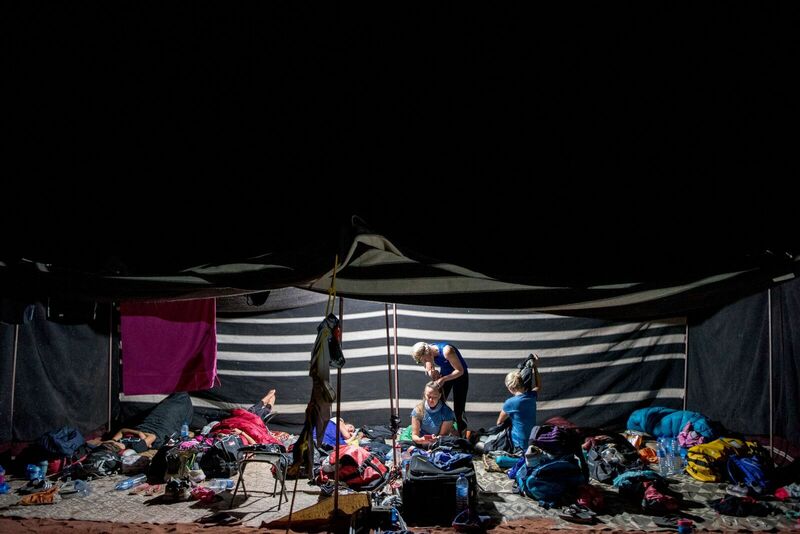 The night’s ven­ue was a desert camp close to the fin­ish line, where there were beds, hot water, showers, prop­er toi­lets and a huge Bedouin barbe­que avail­able to the raven­ous party. The barbe­que was fol­lowed by a prize giv­ing cere­mony, fin­ish­ing places were announced and com­pet­it­ors were called up to the stage one by one to receive cheers from com­pet­it­ors and crew alike, hugs from the two dir­ect­ors and their lim­ited edi­tion fin­ish­ers t-shirts. The even­ing was a chance for com­pet­it­ors to unwind and exchange their exper­i­ences. Amaz­ingly many of the com­pet­it­ors refused to take advant­age of the beds on offer and instead decide to spend one more night shar­ing in each other’s com­pany under­neath the stars. To us this summed up the spir­it of the 2018 group. One of com­pan­ion­ship between crew and com­pet­it­ors, embra­cing the hos­tile envir­on­ment and com­ing through it togeth­er. Each indi­vidu­al, wheth­er com­pet­ing, or simply look­ing to com­plete became a part of some­thing big­ger than them­selves dur­ing the week, and it was evid­ent in the emo­tion­al farewells the fol­low­ing day, that this was much more than a race, or even a hol­i­day, this was an exhib­i­tion of human poten­tial and abil­ity. The fol­low­ing morn­ing a coach trans­por­ted the group to Petra to see the Lost City — one of the few remain­ing won­ders of the ancient world before head­ing back to Amman for the final night in Jordan. It was genu­inely a pleas­ure to wit­ness such an inspir­ing group go through such lows and come out on top. Well done, thank you and con­grat­u­la­tions to all. 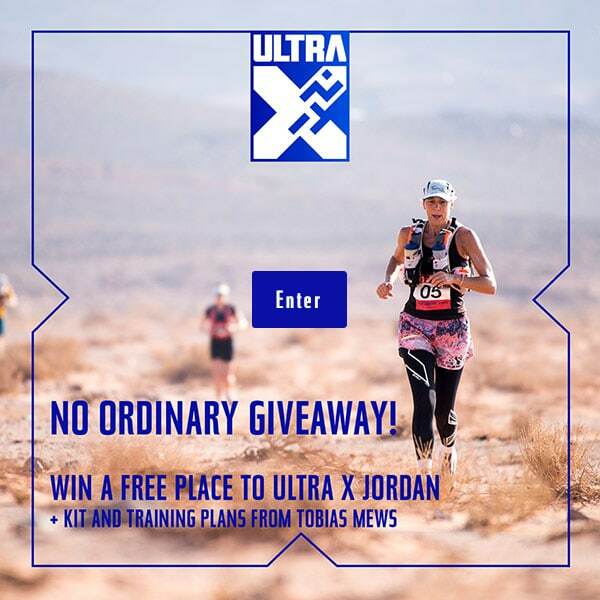 In less than 6 months the dir­ect­ors will be host­ing the next race, this time in Sri Lanka, under Ultra X (the Wadi Rum Ultra rebrand). If it turns out to be any­thing like this it is going to be anoth­er spe­cial week. We can­not wait.